After a baffling loss to a last-place team and with a visit from the NHL's best club looming, the Pittsburgh Penguins called a players-only meeting on Tuesday in an effort to clear the air. For a night, they found one. Playing with an edge they lacked two nights earlier against struggling New Jersey, the Penguins turned away the Tampa Bay Lightning 4-2 on Wednesday to send a message that when they are fully engaged, they remain as dangerous as ever. PITTSBURGH (AP) -- After a baffling loss to a last-place team and with a visit from the NHL's best club looming, the Pittsburgh Penguins called a players-only meeting on Tuesday in an effort to clear the air. "We needed an answer," defenseman Kris Letang said. Playing with an edge they lacked two nights earlier against struggling New Jersey, the Penguins turned away the Tampa Bay Lightning 4-2 on Wednesday to send a message that when they are fully engaged, they remain as dangerous as ever. "We all know that Tampa Bay right now is at the top of the league," Letang said. "They're a really good measuring stick for any team. Tonight was important, especially (after) the two points that slipped the night before. It was a good effort, and I think it brought the best out of us." Matt Murray finished with 33 saves to keep the NHL's highest scoring team in check, and Letang tied Hall of Famer Paul Coffey's franchise record for career goals by a defenseman. Letang's shot from the right circle 6:02 into the second period beat Andrei Vasilevskiy to give him 12 goals on the season and 108 since his NHL debut in 2007. Letang, a five-time All-Star, called the milestone "surreal." He's still a long way off from Coffey's 396 career goals over 21 NHL seasons. "Growing up watching him, I never thought I would have my name next to his," Letang said. Riley Sheahan, Phil Kessel and Sidney Crosby scored during a first-period outburst by Pittsburgh. Evgeni Malkin picked up two assists to become the fifth Russian-born player in league history to reach 600 career assists then drew a 5-minute fighting major in the third period after tussling with Tampa Bay star Steven Stamkos. "That's (his) best game in a while," Penguins coach Mike Sullivan said of Malkin. "He was on the puck. You notice him. He was a presence every shift." Murray withstood an early barrage by Tampa Bay to hand the Lighting just their fourth regulation loss in their last 25 games. "We just kind of got behind the eight-ball and they capitalized on it their couple chances they got," Stamkos said. "It was just an uphill battle from there. So I thought we stuck with it, but just too sloppy to start the game." Sullivan expressed frustration at his team's scattershot play against the Devils, when turnovers and disinterested play in front of Murray dropped Pittsburgh to 1-7-1 against last-place teams. Two days later against an opponent with the inside track to claim the Presidents' Trophy, the effort and the results were far different. The Lightning opted to stick with Vasilevskiy and turned up the pressure on the other end of the ice. 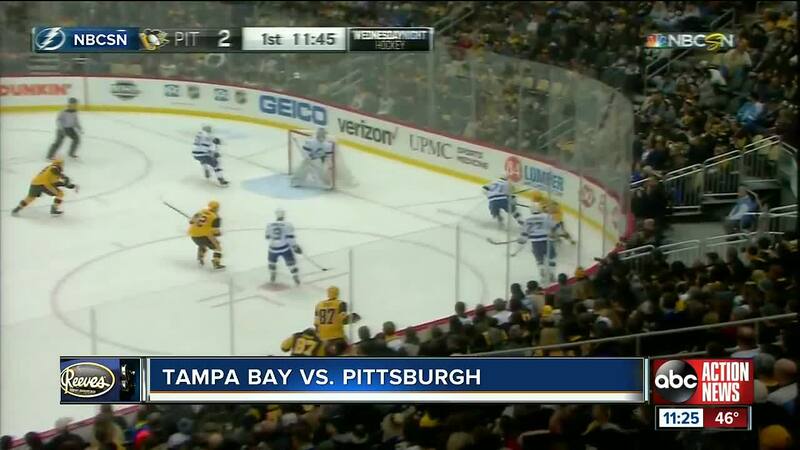 Pittsburgh went more than 17 minutes without a shot on net at one point, but Tampa Bay couldn't figure out a way to beat Murray. By the time the Lightning finally broke through on Miller's goal with 4:05 remaining in the third, the outcome was already decided. "I just thought we lost our legs a little bit in the second, gained it back in the third, clawed back a little bit," Tampa Bay coach Jon Cooper said. "But still you're down four, it's tough."